For a long time now, we have appreciated the standard 4-20 mA signal for 1to-1 analog communication lines in various plants. The time has now come for a new type of communication, namely, fieldbus, which features digital transmission on 1-to-1 communication lines. We have just developed an EJA series differential pressure transmitter with FOUNDATION™ fieldbus communication to be used as one of the main sensors in a plant. The fieldbus communication is to be supported by all models of the EJA series. That is, all new EJA models are equipped with the Standard Resource Block and the Standard Analog Input Block. This paper describes the structure and the characteristics of the EJA transmitter with fieldbus communication. There is strong demand from industrial plants for more accurate plant operation and labor savings in both plant operation and management as a means of improving yields. Not only are field devices required to be more precise and stable, but they must also be more intelligent in order to cut the cost of labor for plant operation and maintenance. 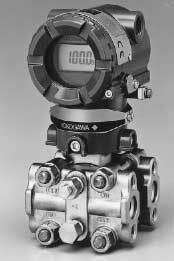 In 1988, Yokogawa Electric released their first pressure transmitter with the BRAIN communication function-a communication protocol in which the 4-20 mA analog signal is mixed with digital signals. Since then, they have continued to release newer models of these pressure transmitters as well as striving to produce increasingly intelligent pressure transmitters, such as the DPharp series. Recently, the focus has turned to the standard fieldbus (with its multidrop connection and full digital transfer) that will replace the conventional BRAIN communication with 1-to-1 connection. This paper introduces the EJA series pressure transmitter that supports the fieldbus protocol advocated by the Fieldbus Foundation. Figure 1 is an external view of the transmitter. We now describe the design concepts and features of the fieldbus-enabled EJA series pressure transmitter. The EJA series transmitter has three blocks for connecting itself to other devices: one resource block and two analog input blocks. These function blocks are configured using the standard parameters specified by the Fieldbus Foundation. Consequently, users can use the EJA series transmitter without needing device information unique to the transmitter. We believe that the ease at which the transmitter can be connected to the fieldbus is its key strength. It also goes without saying that the specific functions of the EJA series transmitter are also possible if that transmitter's own device information (Device Description, or DD) is used. As an EJA series device, the fieldbus-enabled transmitter model inherits the existing industry-proven features of that series, namely, the high-precision, high-stability and high-reliability characteristics. 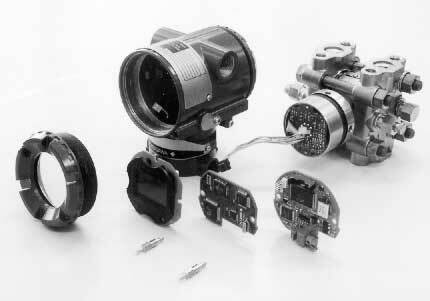 All key components of the transmitter are Yokogawa originals that have been fabricated under strict quality control. The fabrication process involved both automation and mechanization in order to manufacture products with less product-to-product variation in performance. The conventional analog transfer technology is designed to output only one signal for the control information. Fieldbus technology, on the other hand, permits the use of multiple information items such as status information, alarm information, the PV (primary value) and the SV (secondary value). The EJA series transmitter outputs the PV value (the value for differential pressure) and SV value (the value for static pressure), along with the status information. It can also transmit alarm signals if the process value exceeds the limits (setpoints) for plant operation. Furthermore, the transmitter can send out alarm signals once the operating ranges defined in the transmitter capsule specifications are exceeded or if it detects any failure as a result of the sensor's internal judgment or the memory status. The new model is compatible with existing EJA series transmitters, which means that a conventional model based on the BRAIN (4-20 mA analog transfer) protocol can be changed to a fieldbus-enabled model by simply replacing its converter. Bus connection enables users to reduce the cost of instrumentation even below that of the conventional 1-to-1 connection. Furthermore, an additional transmitter can be easily installed next to an existing fieldbus-enabled device at any time in the future by connecting an additional cable from the device to the transmitter. Figure 2 shows the components of the differential pressure transmitter. The transmitter can be roughly divided into the capsule and the transmission block. The capsule comprises the pressure sensing unit, cover flange and process connector. The transmission block comprises the converter and terminal box and can be commonly used for all models in the EJA series. In addition, the transmitter can contain an optional LCD display for on-site monitoring. Figure 3 is a circuit diagram of a fieldbus-enabled EJA series transmitter. The circuit is divided into two blocks: an excitation circuit block that excites the resonant sensor to detect its eigenfrequency and a converter block that applies a computational process to signals in order to convert them into signals for output to the fieldbus. 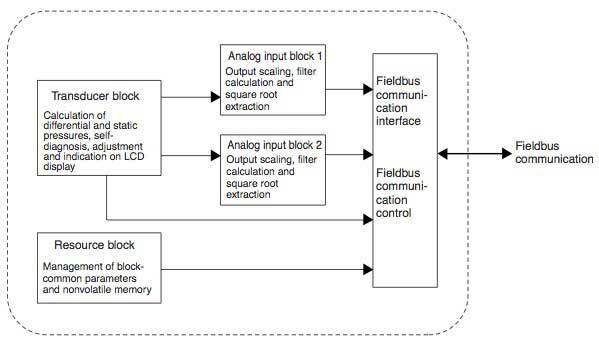 The converter block measures the signal frequency using a dedicated microprocessor and the time interval using a reference clock, so as to improve the resolution. This measurement is carried out continuously to further improve the resolution by means of averaging. Corrective computing is carried out so that a precise reading of differential pressure can be obtained. The transmission block incorporates Yokogawa's proprietary MAU device (ASIC for fieldbus applications) and a communication controller for implementing fieldbus communication. This block manages the common resources for shared use with each function block. For example, an alarm for a failure in the non-volatile memory comes from this block. This block calculates the current differential pressure and static pressure values to transfer them to the analog input. It detects the frequency signal from the sensor and carries out corrective computations using the temperature and static pressure signals. In addition, the block adjusts positioning errors using tuning parameters in order to calculate the differential pressure. The resource and transducer blocks of the EJA series transmitter are designed to comply with the standard specifications. Thus, all of the functions unique to the transmitter are incorporated in this block. For example, the selection of data for the LCD display is carried out in this block, as is the judgment for alarms for out-of-limits operation and device failures. This block receives the differential pressure (instantaneous pressure) calculated by the transducer block and calculates the transmitter's output value. More specifically, the block carries out pressure range scaling, square root extraction (for flow rate calculations), output-scale calculation, filter calculation, and so on. The calculated output is used as the transmitter's output and transferred to other field devices along with status information. The EJA series transmitter has two analog input blocks, each of which are designed to separately perform the computations noted above for both differential and static pressures. In this paper, we discussed the features, structure and functionality of the fieldbus-enabled transmitter of the EJA series. This recently developed model is provided with the common functions of the fieldbus standard and prioritizes the need for an easy transition from the conventional instrumentation method. We are confident that this product will help spread fieldbus technology and enable future plants to achieve labor savings and precision operation. As technical infrastructures such as engineering tools improve and fieldbus technology spreads, we believe that more advanced functions, which require only simple work operations, will be increasingly possible. We continue to monitor market trends and strive to offer solutions that meet an even wider variety of user demands. DPharp is a registered trademark of Yokogawa Electric Corporation. Saegusa T., et al., "DPharp Electronic Differential Pressure Transmitters," Yokogawa Technical Report, Vol. 36, No. 1, pp. 21-28 (1992).